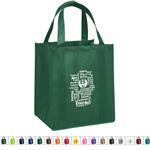 A great medium size custom printed grocery tote bag. 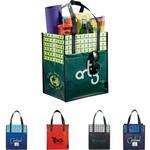 Perfect alternative to plastic bags and it is eco-friendly recyclable. Open main compartment with supportive bottom board. Interior fabric loop at opening for attaching bag to supermarket checkout frames. 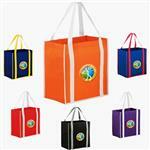 Reinforced handles and binding for added durability. 10" handle drop height. 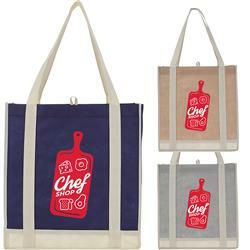 This is a great new look for the non-woven grocery tote!